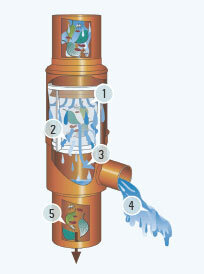 Filters and collects rainwater for water butts and smaller rain tanks. For roof areas up to 150 m². 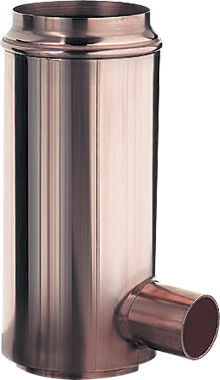 Available in copper or titanzinc. Suitable for downpipes DN 100. Can be reduced to DN 80 and DN 87 with a special reduction set, if necessary. 2. of the filter cartridge and is accumulated through a union. 3. The water is led from the interior to the exterior and is being filtered/cleaned. 4. Cleaned water is led through the cartridge outlet channel to the storage. 5. Dirt is led into the sewer system. 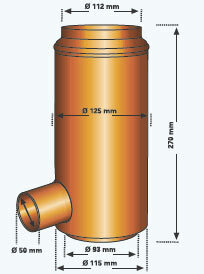 Rainwater filter for installation in metal downpipes. 3P Downpipe Filter installed in a downpipe made of zinc. The cleaned water is led through a 50 HT-pipe in a concrete tank.